The handler had two options. If he ran, he'd be shot. If he didn't, they might kill him anyway, an example for the others. There were to be three sensor drops this night, his most important assignment yet, and now there'd be none. None! What excuse could he use? He ran the pre-flight tests as carefully as ever, the evening air was calm and he launched at the specified time. His flight monitor was working as it always had, recording launch-point coordinates, time, barometric pressure and flight data sent from the bird. Everything was perfect for the first three miles of flight. Then the bird abruptly plunged one hundred twenty feet, and all motion stopped. There'd been no time to release the sensor package. Aghast, he watched the owl's Global Positioning System coordinates change ever so slowly on his monitor display. They continued changing  sometimes faster than a walk, other times not. Twenty minutes later the changes stopped. Someone must have shot the bird down and taken it away. Why was it flying that low? Why hadn't his monitor warned him something was wrong? A tiny red light showed the bird's recovery beacon still working, but it no longer mattered. Recovering the owl was a task for others in the Movement. He was only a handler. Where could he run, hide so they'd never find him? He swallowed hard and began writing down every detail he could think of, everything he could still see in the deepening dusk. Then he packed away the recovery gear with trembling hands and headed for the rendezvous. He crouched there in the blackest shadows, sick with dread, and waited for his partner with their car. He'd have to report the loss, and quickly; follow his training or be shot like a rabid dog. No handler ever knew when enforcers might be monitoring a flight, so it would not do to alter facts. If he chose not to run, he'd have to stick to the truth. But he wanted to run. He made the damning report in code, from the car. Without a backup bird, the two men could do nothing but wait. It didn't take long. Instructions were returned in code, spelling out coordinates and a time. The car's GPS directed them to turn off the highway onto a secondary road with no route marker or name, then drive half a mile. They stopped, turned off the headlights and stared into the darkness. Neither man spoke. They'd achieved fifty-four nights of success in twelve northwestern states, one hundred thirty actual sensor deliveries, and this was their first mishap. No bird had ever been lost when instructions were followed precisely, or so they were told. Was it true? Were they the first to lose one? Would that make them an example for others? There was no way to verify that teaching, for each team reported to just one individual. All teams understood the reasons for secrecy, and methods used to achieve it. All teams were dedicated to the Movement, and that was enough. They had no reason to know others. They needn't know how many handlers there were, or how many birds, or even whether other birds had been lost or damaged. They knew only that several handler teams were assigned to larger territories, so one might guess there were dozens of birds and teams. Another team might be no more than a few miles away. They wouldn't know; no one would tell them. While such facts were not important, the loss of a bird was. A bullet in the head was. A black sedan with headlights off eased up behind them, and a man in dark clothing got out. He was a stranger. "Get into the other car," he ordered, taking the driver's seat and starting the engine. The handler started to object, but thought better of it. He avoided looking at the man, got out and entered the other car. His partner followed. Both were hooded, then handcuffed to a steel bar behind the front seat. The handler felt the engine start. "Where are you taking us?" he wanted to ask, but didn't. Perhaps running would have been the better choice after all. Death would have seemed farther away  for awhile. The crowd at Niels' Place was typical of weekends, but this was a Tuesday night. Patrons were crowded in the lobby; others smoked outside. Tricia tugged at Jim's sleeve as they approached. "Good thing we reserved our table, Mr. Foster." He twisted his mouth. "Looks like we might not get it." "Mm-hmm. And our name tonight is Adams, not Foster. You forgot." "Bribe him enough, Mr. Adams?" "The game changes when crowds are big. You know that." She stifled her annoyance. They'd planned to discuss his growing edginess while enjoying a fireplace table in one of the prettiest restaurants in all Denmark. It was too late now to change their dinner plans. Jens, the anxious headwaiter, whispered an apology. He stood close to Jim, barely acknowledging her, and spoke quickly. "I'm so very sorry, Herre Adams, but both fireplace tables were assigned tonight by the owner himself. As you can see, we are unexpectedly crowded. On another night I will see you get a fireplace table." He swallowed hard. Jim turned the distressed fellow away with a hand on his shoulder, speaking low. The man's white head nodded and he seemed to grow taller with each word. Moments later he approached her, smiling. Jim would follow at least a dozen paces behind, the chameleon blending into its background like grouse in a wheat field. He'd sense the room, absorbing its message while others ogled her. She expected it, dressed for her part in it. This night her jet-black tresses were swept up. A cocktail dress in cyan put lights in her blue eyes, and parrot earrings splashed color. Her body did the rest. Conversations halted and forks paused between plate and mouth. Women arched eyebrows. It happened everywhere he took her, even when she wore old jeans and a sloppy sweater. While oglers and the envious focused on her, Jim's brain recorded details: a man over here, dining alone at a table for six, watching the room and all those in it; a quick glance away for no reason by a woman over there; a newspaper quickly flipped up or a sudden change in postures or conversations. His skills kept them safe in a world where inattention could mean disaster or death. Twice they'd departed a restaurant through its kitchen. Once at an airport they'd skipped a flight when he spotted someone in the gate area watching them far too intently. Yet they no longer talked of bounty hunters. Their caution was second nature now. Jens led her to a table well to one side of the huge stone fireplace, where a magnificent fire was set even though it was May. He pulled back a chair and forced a professional smile as she flicked a glance at the table she'd wanted. One of three men sitting there leered back. She'd heard his comment as she passed, and for a brief moment her eyes flared. Just as quickly she stepped back into character, exchanging pleasantries with Jens before he left. Jim shot a quick glance at the trio as he joined her. He spoke under his breath. "The gross one with the bushy beard hit on me." "I trust it was high cesspool." He stopped short of a smile. "Ignore him. Look, we can still see the fire from here." His advice was short-lived. They'd barely returned from the buffet when the bearded one crassly summoned a waiter and berated the poor soul for not clearing used plates quickly enough. Other diners seemed to think it funny. Some applauded. Were they all members of some group? Jim ate thoughtfully, alternating between the boorish patron and the fire, part of which had suddenly gone out. A log closest to the room smoked, rather than blazed. Like some entity from a magic lamp, the smoke curled out and down, creeping along the carpet like a stalking cat. It curled in a spiral under the trio's table. "Jim, are you doing that?" Tricia whispered, hiding a grin with her hand. "Doing what?" He nonchalantly refilled her wineglass. The smoke wafted up, seeping out around the tablecloth, followed by more from the smoldering log. In moments all three men were coughing and waving it away. The poor waiter was again summoned, louder than before, but this time the suffering soul was not alone. Jens came with him. Both men strode to the table past laughing diners, but by then the smoke had drawn back as if the chimney were a vacuum cleaner. The log had rekindled and was happily ablaze. There followed a comedy of yelling, wildly waving arms, fluttering napkins and theatrics, with all three men complaining at once. The bearded one heaved his bulk from the groaning chair and acted out the smoke's antics, draping his arms knuckles-down like some barrel-bellied Neanderthal and churning along the carpet with chubby hands. He shook his finger at the brightly burning log, scolding it like a naughty child. There was not a clue anything unusual had happened, except for the slight odor of smoke that hovered around the fireplace anyway. Silence dripped from the rough ceiling beams. Someone coughed. Jens and the waiter stood stone-faced. Scowling, the bearded one bent over with a grunt, missing his dinner napkin twice before snatching it up, then cursed loudly and slammed back onto his cringing chair. Jim mouthed his appraisal with an index finger raised. "High cesspool." In moments the waiters were on their way back to their duties, but no sooner had they left than the smoke was back, thicker than before. Fully half the fire had gone out and the roll of smoke completely filled the stone opening before billowing out to engulf the trio. A second table sharing the fireplace hearth was totally unaffected, but the couple there wisely decided it was time to re-visit the buffet. Tricia smirked. "Jim!" She pawed at his leg. This time all three men bolted, one chair toppling over as silverware and goblets flew. The logs burst again into flames and the smoke was sucked back, disappearing up the chimney like a playful ghost, but this fact was ignored in favor of a raging tantrum by El Beardo, which again brought Jens and the waiter. A third man was with them, the owner. His appearance had a calming effect and the trio was escorted to a more distant table. In moments the original one was cleared and a fresh tablecloth whisked into place. "How did you do that?" Tricia whispered. step out of the way. My brain does the rest." "What were you thinking just now? About the fire?" solid, maybe?" He shrugged, a slight frown creasing his forehead. "I guess that's it." "So oxygen couldn't get to that log? It couldn't stay lit?" "Once it smoked out, the rest was easy, but you already know that part." He stopped. "Trish, why are you looking at me that way?" "You just put out a fire." "Just a little part of one." "No, you did more the second time. More of it went out. Do they have to be small before you can do it?"
." He stopped as the full meaning of her questions registered. certain of the world's deserving homeless, but that's not quite what this generous man calls meaningful. "He averts a doomsday showdown between the world's two most powerful nations, risks his life in dozens of ways doing so, only to be condemned, labeled a terrorist by both White House and Kremlin, then hunted like wild boar. What does he do? Shrugs the whole thing off and argues it was all coincidental. Those two leaders would have mended their fences without him, he says. He prepares to send the White House a cool hundred million for repairs, until his far more sensible wife talks him out of it." "I'm just getting started. When professional teams of murderers kidnap a friend and threaten to kill him, my hero charges right in for the rescue. Once more he risks his life many times over, but is too modest to admit that little detail. Cries when he's forced to hurt others, even those who want him dead. Careful not to step on bugs." "Trish, this isn't the place"
She held up her hand, palm forward. "Not finished yet. There are hundreds of things he can do with his mysterious power, but they'll all lead to exposure and ruin, or will hurt someone, or take something rightfully theirs, or worse. Everything he's thought of has some flaw in it. His curse is that he has a power he's forbidden to use. His own words." He closed his eyes and let out a long breath. "Except casinos." "The one exception. There, the money has already been gambled away. He takes a small fraction with never an eyebrow raised, now to the tune of nearly a billion dollars over the years, all of which has been used by Graham Foster's organization or is salted safely away for future charities. Now my marvelous lover, husband and partner has discovered he can use his powers to put out fires, which won't hurt anyone or take something rightfully theirs, and he's already thinking up reasons why he can't do that. I ask how anyone could"
"I'm not thinking up reasons. Offhand, it might be workable. I need to dwell on it a bit." He watched her expression change. "Trish, did I ever tell you your whole face lights up when you smile?" She wriggled on her chair. "So?" "So we'll talk about it later, not here. How about the botanical gardens, after dinner?" "What's wrong with here, Mr. Grumpy? We came here to talk." "Actually, quite a bit. According to Jens, these people may be the Danish Mafia, if there is such a thing. It's why he was so upset, but not to worry. They don't traffic in Irish beauties, even if the beard dropped his fork over you. Besides, there are worse in Washington, D.C. We know some, don't we?" Fire Owl Copyright © 2004. Gerald W. Mills. All rights reserved by the author. Please do not copy without permission. Benjamin Howland, Secretary of the Interior, represents all that America stands for. He is gracious, knowledgeable, a war hero and true patriot. Yet… he has a darker, secret side. Propelled by twisted delusions, a distorted sense of goodness and justice and blind, cold ambition, he’s planned a mad conspiracy that will bring back America to its old glory. Yes, blood will flow down the streets. Thousands of men, women and children will die. But what better way to unify a country than through great tragedy? The date: the 4th of July. Always on the run with his beautiful wife Tricia, James Foster, known as a world-class terrorist and nicknamed the “Mudslinger,” has just discovered a new facet to his “alien,” unnatural gifts—he is able to “quench” fires. If he succeeds in getting back to the States on time, he might be able to help with those fires and save many lives. But will he—when the American government has put such an exorbitant prize on his head and several contracted killers are after him? Suspense and spine-tingling, non-stop action await you. An excellent knowledge of electronics, fast-moving scenes, believable characters and sparkling dialogue combine to make this a book you won’t want to put down. Like watching a 007 film, it will grab you by the throat till the end. Though the book stands fine on its own, I would recommend reading the first two books in the series, Then is the Power and The Mudslinger Sanction, if only to become more acquainted with the protagonist’s struggle to understand and control his own nature. Reviewed by Mayra Calvani for The Midwest Book Review. Electronics and science buffs will enjoy Gerald W. Mills' precise description of the deadly owl aircraft. Add to his scientific and engineering expertise his mastery of narrative and language, of suspense, taut drama, and character creation, all of which rise to a peak of excellence in this tale of conspiracy, murder, and arson at the highest levels of government. Reviewed by Florence B. Weinberg, author of The Storks of Caridad. An exciting tale with loads of action. The third in the series of James Foster's adventures in his search for a place to belong and understanding of his near magical power over the wind. An ungrateful government that does not trust what they cannot control has put a price on James Foster's head and so have privately funded groups, all who see him as a near maniacal power hungry man who could and would destroy the world to get what he wants. This misunderstanding, whether deliberate or accidental, causes James and his wife to constantly be on the move as they are always hunted. 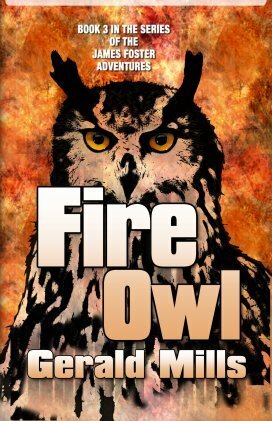 In Fire Owl, the very talented author, Gerald W. Mills, uses his considerable imagination to give the reader another great adventure where James has become aware of an extension of his ability. While James Foster is learning to use his new talent, Secretary of the Interior, wealthy Ben Howland is considering a scheme that will give him control of the government, a scheme so frighteningly real, the reader will be checking the newspapers to see if they've caught the man and his henchmen. The question is: Will James Foster be able to learn to control his new talent before Howland puts his plan into its final stages, an action that would ravage the country from coast to coast and cost countless lives. Or will those who hunt Foster, be successful in capturing or killing him first. Highly recommended reading for any reader searching for excitement with a difference. A book you won't want to put down and one you will want to read more than once. The balance of tension between the characters and their actions will have you biting your nails. I guarantee you will enjoy this tale. I certainly did and look forward to the next adventure by this talented author. Reviewed by Anne K. Edwards, author of Death on Delivery.